New Toolbox offers easy access. 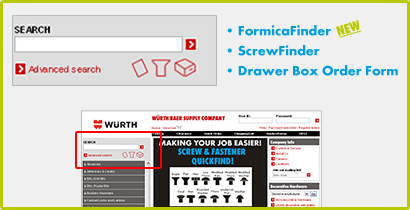 FormicaFinder – This is our newest tool that helps you quickly find the Formica laminate products we have available online. The tool features Formica Laminate and Formica Solid Surface products. Screw & Fastener QuickFind (ScrewFinder) – Using this tool, you can quickly sort through the hundreds of different sizes and types of screws and fasteners we carry and then place an order for just the product you need. Online Drawer Box Order Form – This form gives you the ability to quote a set of custom made drawer boxes or just place an order directly through the form. The form allows you to define drawer boxes that are just the sizes you need and made from multiple different wood materials. You get an instant price quote and can order as many boxes as you like all in one easy-to-use form. We hope you enjoy the changes we are implementing to make your online shopping experience more enjoyable.